Tanks can start to smell when not cleaned properly. 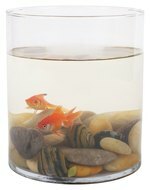 Fish, reptiles and rodents are usually housed in glass tanks, which should be cleaned frequently, both for the health of your pets and the smell of your home. Harsh chemical products should never be used on a tank where an animal lives. Instead, try white vinegar. Vinegar neutralizes odors, cleans glass and is safe enough to use for spot-cleaning without removing your animal from the tank. Spray the mixture onto areas of the tank that need attention. Rub the tank with a soft cloth until it appears to be clean. No rinsing is needed. Empty the tank completely. 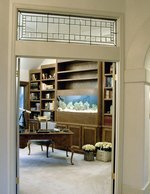 Keep all fish, reptiles or rodents in an environment where they will be safe for at least 30 minutes to an hour. Fill the tank halfway with white vinegar, and let it sit for 20 to 30 minutes. Dump the vinegar out of the tank. Scrape the side of the tank with a razor or algae scraper to remove any algae or calcium buildup. Wipe the inside of the tank with a dampened soft cloth, paying close attention to any areas that appear to have a buildup of dirt and grime. Rinse the tank thoroughly with cool water before replacing your fish, reptiles or rodents.